Arrowhead Studios, most famous for their hugely popular action-adventure game; Magicka are back with a brand new title, Helldivers. Leaving the mysterious forests and sorcerers behind them, now we are fighting for the freedom of Super Earth (not even joking, that’s the name of the planet) from three warring intergalactic factions. While on the surface it looks like your run of the mill, time-killing twin stick shooter, Helldivers is a very skill-intensive game with a series of deep mechanics and a rich multiplayer concept that had me struggling to put it down. Set in the middle of an intergalactic war between three competing factions, the insectoid-Bug, the gun-toting Cyborgs and the technologically advanced Illuminates. In this crazy universe, you play as a member of an elite squadron of space marines who are tasked at defending Super Earth (what the Earth has been renamed after all of the countries formed a unified government in order to stave off the alien attacks) from these three invading forces. 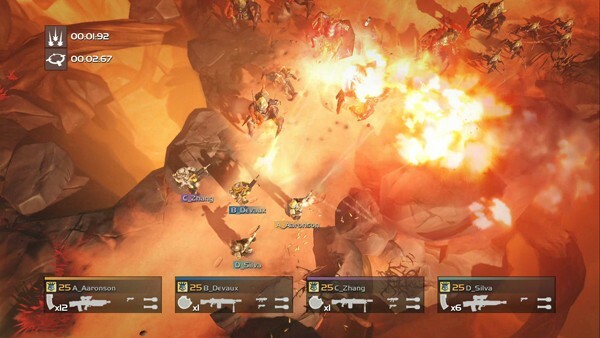 Fans of Starship Troopers will feel immediately at home with Helldivers, which wears its inspiration on its sleeve and features the same style of humor, and storytelling (even a trophy or two named after direct quotes from the feel). 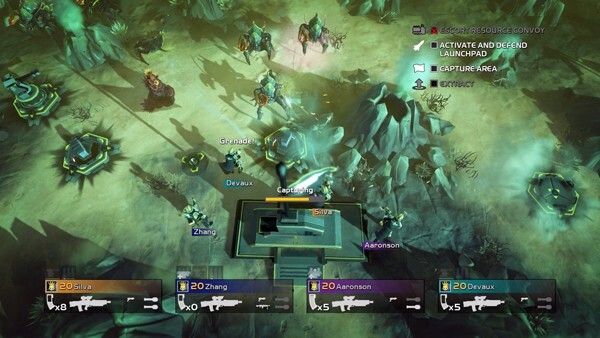 Helldivers is a top-down, tactical shooter that at its face looks like a twin-stick shooter, but when you really delve into the game you see it is so much more in-depth and frankly, intense than you would have imagined. This is a game of preparations and strategy, if you just launch yourself into the middle of a map with no supplies and no set goals in mind then you are likely to be wiped out. Each of the game’s levels are littered with goals and objectives (ok maybe littered is a bit of a stretch, but some stages have quite a few different objectives), but the closer you come to these objectives, the more enemies you are likely to encounter and because of this it is integral to plan your paths ahead. Not only do you plan where to go and what you will be doing, but how you will be doing it, and the how is almost the most important part. Before battle you will equip yourself with a variety of arms like a long-range sniper, or a close combat shotgun. 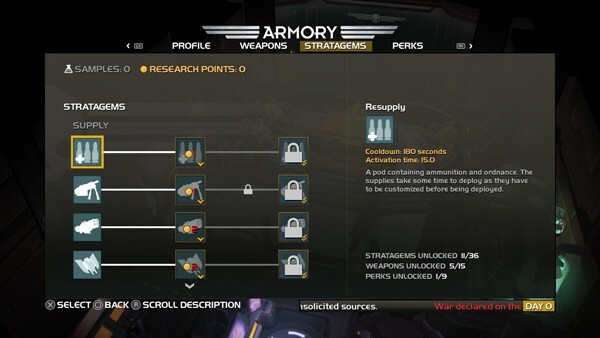 Not only that, but special perks and call-downs called “Strategems” can be equipped to make your job just that little bit easier. There is a lot of flexibility and choice in Helldivers. The tools are all there but the burden is very much on the player to figure out how to most effectively use them. Following on from that, it is fair to say that this game is challenging and until you are very, very familiar with the mechanics, you will die… a LOT. Just about everything can kill you in this game; enemies, friendly fire from teammates, walking into the line of fire of your own drones, or even your own strategem drops can land on you and wipe you out. Death is a very real part of the game and it might deter some players away before that can experience the full scope of what this game has to offer. Helldivers is a very multiplayer-focused game that almost requires you to play co-op (which is done either locally or via wifi). 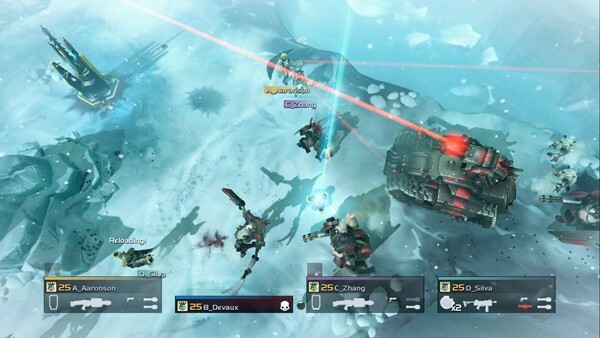 I’m not usually big on games that require an internet connection to function properly, but Helldivers does something a little different with the concept that helps ease my anxiety about connectivity issues. The world of Super Earth and its surrounding galaxy is alive and constantly changing. In addition to typical leaderboards, players can see enemy kills, human deaths and worlds conquered all in real time. It is a neat addition that helps the world and community feel a lot more connected. When all is said and done though, you can take Helldivers solo if you wish, but you lose a lot in the process. As I mentioned earlier, this is the kind of game that wears its inspiration on its sleeve, and this is as true for the visuals as it is for the story. 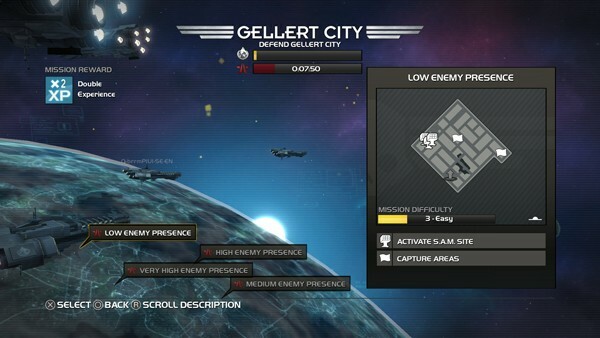 When I first started playing, I thought that Helldivers had a very “StarCraft” vibe to it all. Similar locations, similar art style and the Bugs could easily be misidentified for the Zerg at a passing glance. However, when you spend some time with the game, you will see that aside from its obvious inspiration, it is a world comprised of simply gorgeous landscapes. Now not everything is lush or vibrant, but even the most desolate wastelands are handled with care and they just look amazing – even on the Vita’s small screen (I can only imagine what the game looks like on the PS4). I’m not going to lie, when I first booted up Helldivers I didn’t know what to expect, or have too many high expectations. I had never played Magicka and hadn’t heard all that much about Helldivers to begin with, but I was absolutely blown away with what I got. It’s tactical shooter gameplay, intricate and in-depth mechanics and dynamic world really create an experience that is the most fun I have had on my Vita since I bought it and I cannot wait to finish typing this sentence and getting back to my defense of Super Earth.